Americans are conditioned to think of North Korea as a rogue state ruled with iron fists by three generations of a family of despots, elevated to god-like status in their country’s propaganda. We hear only sporadic reports from a hermit nation, closed to outsiders, where a tiny ruling elite live a life of luxury in the showcase capital, Pyongyang, while the bulk of the population suffer extreme deprivation under a reign of terror wherein dissenters and their families are executed or sent to brutal concentration camps. According to President George W. Bush, North Korea, along with Iran and Iraq, formed a tripod leg of the “axis of evil” of the three most dangerous regimes capable of threatening the world with nuclear disaster. This perceived North Korean tinder box has been primed even more under the Trump administration as Kim Yong Un who assumed supreme leadership for life in 2011 in his late 20s on the death of his father has continued nuclear testing, in spite of retaliatory Western economic sanctions, to a likely capability of striking US territories. Meanwhile, the lower half of the Korean Peninsula, divided since the 1950–53 war after northern communist forces invaded the south, America’s ally South Korea, is a developed country with a high-income economy whose citizens enjoy the latest in consumer goods and popular culture. Small wonder that despite a heavily guarded border some defectors from the north have managed to make their way south risking death to escape hunger and oppression. Until recently, these defectors, along with southern petty entrepreneurs who dare to smuggle Western goods into northern local markets have been our main source of information about life under the idiosyncratic relict communism in North Korea, which seems more like a militaristic totalitarian regime ruled by bureaucratic state capitalists than a practitioner of socialist ideals. Enter writer and art historian Travis Jeppesen who in 2016 became the first American to study at a prestigious North Korean university. In See You Again in Pyongang: A Journey into Kim Jong Un’s North Korea he shares a memoir of his experiences living, traveling, and studying over a month-long Korean language program brokered and shepherded by a tour agency catering to foreigners. Though the course was short, Jeppesen’s insights are anchored in his three previous brief visits to North Korea for which he has a strange fascination as part of a broader interest “in cultic systems of belief and their twisting of ideology” acquired at university in New York City. Yet this makes sense given Jeppesen’s passion for demystifying intrigue, decoding the seemingly incomprehensible, and uncovering logic in the apparently arbitrary. In this respect, Pyongyang as the capital of one of the strangest counties on earth to Westerners, an international pariah, universally demonized, at times a laughing stock, feared, and generally misunderstood, with one of the most bizarre leaders, offers the perfect challenge. Jeppesen’s account of his stay in Pyongyang itself requires some deconstruction. North Korea presents formidable challenges to outside researchers particularly with respect to ethics, protection of sources, and verifying data. So, many figures in the book are composites using pseudonyms, events are often conflated from experiences over several trips, and the tour agency Jeppesen used is a fictitious hybrid based on his knowledge of several of the state-owned tourism bureaus. Paid defectors were also avoided and facts were checked as much as possible in a society where “truths” are manufactured for the citizens’ supposedly unquestioning consumption. Jeppesen is also mindful of the ethics of Western travel to North Korea as these revenues have been rumored to support the nuclear research program. And some Westerners might have been lured by the perverse attraction of “dark tourism” spurred by fascination with a sadistic regime despite the assumption that most encounters with locals are orchestrated state propaganda thinly camouflaging widespread human suffering. Lastly, there is always the possibility that foreigners might offend somehow and end up like Otto Warmbier, the American college student sent home in a coma to die after incarceration for alleged attempted theft of a propaganda poster. Given these constraints, this book is not so much a travel journal as a contextualized reflection on how some more privileged North Koreans (only a few fortunate people get to live and work in Pyongyang) cope with life in a bubble, cut off from the rest of the world, under constant state surveillance with the ever-present threat of banishment or worse. And how are they adapting to the recent easing of economic sanctions and possible political openings allowing them occasional glimpses of the West through encounters with tourists such as Jeppesen and blackmarket consumer goods such as Western movies and music on SD cards and USB sticks (which can lead to dire consequences if caught). Lastly, how do they tolerate the fabric of blatant propaganda and denial of truths they must internalize to survive? See You Again in Pyongyang does not give us any clear answers to these questions, but the sequence of events, encounters, and experiences over Jeppeson’s stay, from his studies (he is the only student in his course), evenings in restaurants and clubs for foreigners, though carefully curated outings to approved tourist venues and political cultural performances, his discussions with two travel companions also using his tour company, and interactions with the composite characters teaching, guiding, policing, and otherwise brokering his stay provide some clues. Jeppesen’s primary guide, a somewhat sympathetic 26-year-old woman named Min who speaks fluent English from her youth in Cuba is a case in point. Min’s chubby figure and pale skin attest to her successful position in North Korean society (most Koreans are scrawny from chronic undernourishment and hard labor). But even more, her constant search for possible personal entrepreneurial opportunies reveal her readiness to embrace future openings for business transactions with Western partners despite current apparently insurmountable official obstacles. This openness to potential outside joint ventures, along with an overall welcoming attitude to foreigners, is particularly remarkable given that North Koreans have been brainwashed by their propaganda machines to regard Americans, in particular, as brutal sub-humans largely responsible for the Korean War and the devastation occasioned by bombing as well as atrocities on the ground against civilians. See You Again in Pyongyang offers some thought-provoking first-hand insights into daily life in North Korea, deconstructing fallacies around a number of our stereotypes about that enigmatic hermit nation at the same time as it exposes their social constructions about us. The book is quite readable, written in an engaging personally positioned style, although the author is prone to lapsing into distracting purple prose. Indeed, the writing can seem rather forced, which seems strange for an acclaimed creative arts critic and science fiction author. Perhaps the very exercise of writing about life in a forbidden kingdom where concealment is the name of the game, fostered the fabrication of a verbal shroud? 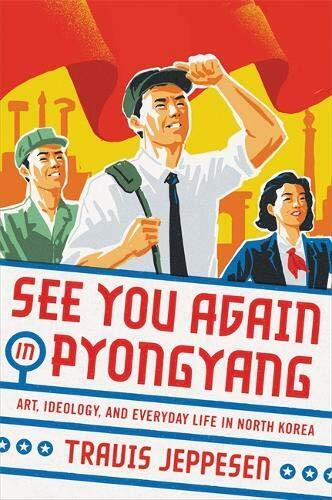 Above all, See You Again in Pyongyang is important reading for its timeliness at a critical juncture in US negotiations with North Korea about denuclearization. However, in North Korea little is ever what it seems to American eyes, such that Kim Yong Un’s claims to have demolished his main testing facility are likely offset by his apparently successful development of mobile ballistic missiles while the American tracking program is bogged down in bureaucracy. The Korean jackal may still have the trump card!